The tentatively named "Apple Watch Series 3" will feature a new glass-film touchscreen in place of the current touch-on-lens solution, with shipments to begin in the second half of this year, according to Taiwan-based DigiTimes. While it remains unclear if the switch to a film-based solution will have any obvious consumer-facing benefits, this is more interestingly the first rumor to surface about the supply chain ramping up for the next Apple Watch. The timeline matches a Chinese report last month that claimed the third-generation Apple Watch will be unveiled in the third quarter of 2017 with battery life and performance improvements. The report said Series 3 models, to be manufactured by Quanta, will lack any significant hardware changes. Few other details are known about the next Apple Watch models, which could feasibly launch alongside the "iPhone 8" in September. 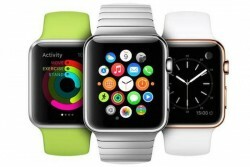 KGI Securities analyst Ming-Chi Kuo and other sources have claimed the Apple Watch could gain an LTE chip for cellular capabilities as early as 2017, while a supply chain report last year said Apple may switch from OLED to micro-LED displays for the Apple Watch in the second half of 2017 at the earliest. Micro-LED displays have benefits such as thinness, lightness, improved color gamut, increased brightness, and higher resolutions. The panels do not require backlighting like traditional LCD displays, but they can be difficult and expensive to mass produce. Micro LEDs range in size from 1-micron to 100-micron. Apple has filed patents for a number of ideas that could eventually be included in an Apple Watch, such as a heart rate identification system, modular bands, haptic feedback band, and a band with a built-in charger. More significant health and fitness features could be added pending further FDA approvals. Ahead of Apple Watch Series 3 models, Apple is expected to introduce new bands at its rumored iPad Pro-focused event next month. Those in my life that have them wear them because they think it's fashionable and makes them look cutting edge. I just purchased my Series 2 couple weeks ago. Lame!!!! For most people, an Apple watch is almost useless. I don't need yet another screen alerting me about text messages and emails. Those in my life that have them wear them because they think it's fashionable and makes them look cutting edge. That being said, if Apple ever adds a camera for video calls I'll buy simply because video watches have been featured in so many old time sci-fi shows and movies. The way I look at it, it's not "yet another" screen alerting you, but more of a replacement screen, as sounds and vibrations are disabled on your phone when you're wearing the watch. The benefit of this is subtle yet drastic if you're anything like me (i.e. somewhat easily distracted) - any notification on your phone is a potential time drain as checking it can so easily lead to a few minutes' scroll through facebook or a news app etc, often before you've even realised you're doing it. Getting notifications on your wrist, on the other hand, adds a bit of distance from your time sink apps that means when I get a text or some other alert, if I'm not responding to it immediately my wrist goes down and I'm back to what I was doing. Furthermore, a tap on the wrist and a small flick to check it is much less disruptive to concentration than a buzz in your pocket that leads to pulling your phone out for a look-see (as you never know which buzz is going to be important). Of course this might all be irrelevant if you're an Adept of Attention but I've definitely noticed a severe drop in phone-related procrastination in the (almost) two years I've been wearing mine. The Apple Watch is the one item that I wish Apple would spend its time thinning rather than MacBook Pros and iPhones. My series 2 is OK but it's so bulky. The ergonomics are OK and it's still a bit of a solution to a problem I still haven't figured out yet. can anyone explain to me how "glass-film touchscreen" is different than "touch-on-lens" and why it matters? just bought a series 2 and can't imagine this would be a huge improvement of any kind. In a Touch-On-Lens (TOL) design, the ITO (transparent conductive material that makes up the sensor pattern) is deposited onto the rear surface of the glass front panel that you touch. This has the benefit of having only a single physical layer of glass between the user and the display, so the display is brighter & clearer. It is also useful on larger multi-touch displays as you can make the edge traces thinner on a TOL design, as it is easier to pattern silver onto glass. However, yields are typically a bit lower than a film based design, and costs are slightly higher. Also, as the active layer is part of the front glass, if that is cracked, it can lead to loss of touch function. A glass-film design (GF) uses a glass front panel that only has decorative print on it (no active circuitry). All the ITO pattern & side traces are printed onto a separate flexible PET layer. This is laminated to the front panel using an optically clear adhesive. The benefits of this are that it's more rugged (damage to the front panel doesn't affect the touchscreen itself), it's cheaper to make, and yields are typically slightly better than TOL or Glass-Glass designs. It's best suited to smaller designes where the side traces are fewer, so there's no problem of them being thicker. However, it does mean the overall distance from where the finger touches the screen to the image on the display itself is larger, as there's more layers. Also, there's a drop in brightness & clarity as you have more layers for the light from the display to go through. I swear if Series 3 rocks the same design / chassis I'm going to flip out. Rectangle or circle. There's really not much otherwise. There are design considerations like beveling, squaring the corners or extra buttons, but it's a watch. You kinda have two options. They already have the rectangular version. At some point soon, they're going to intro a round version as well. Just my opinion, but I'd put money on it. This might be the year I actually buy an Apple Watch. Might be worth it to skip Gen 2. Excited to see what kind of update apple can bring to the AW. I've been holding off on getting one. Can't justify the price for now.